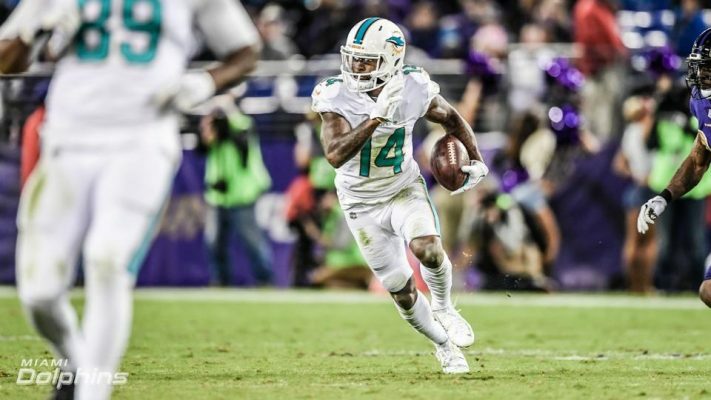 Despite earlier reports that Pro Bowl wide receiver Jarvis Landry was on the trade block as the NFL trade deadline approached, it now appears certain that Landry will remain a member of the Miami Dolphins for the foreseeable future. ESPN’s Adam Schefter first reported the news via his Twitter page. “Zero chance” Dolphins trade WR Jarvis Landry today, per league source. Not happening. Landry has solidified himself as one of the best possession receivers in the NFL and topped 1,000 reception yards in each of the previous two seasons. While Landry is currently projected to see a dip in his receiving yards by season’s end – with just 398 yards through seven games – his three touchdown receptions this season puts him on pace to exceed his highest season total of five back in the 2014-15 season. His best performance so far this season came just two weeks ago against the New York Jets when he caught seven passes for 93 yards and a touchdown. The fact that Landry will remain a Dolphin should be a huge relief to fans who were shocked when star running back Jay Ajayi was traded to the Philadelphia Eagles in return for a fourth round draft pick earlier today. Any trade involving Landry would have been a glaring sign that the Dolphins’ front office was prepared to blow up their roster and rebuild. With Landry still in Miami, it appears the Dolphins intend to build on their 4-3 season record and fight to return to the playoffs.